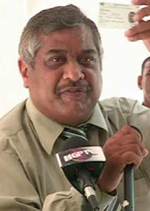 Accountants of Guyana (ICAG) are inviting the Publisher of Kaieteur News, Glenn Lall, to lodge a formal complaint against Commissioner General of the Guyana Revenue Authority (GRA), Khurshid Sattaur, who is a member of that association. The ICAG said that it stands for transparency and accountability and it takes accusations of breach of professional ethics by its members seriously. Over the past weeks, Kaieteur News published several email between the former president, Bharrat Jagdeo, and Sattaur which exposed their apparent plot to “close down” the Kaieteur Newspaper. The ICAG is the body responsible for the regulation of the accounting profession in Guyana under the Institute of Chartered Accountants of Guyana Act 1991. It is a public interest body whose objectives include the promotion and increase of the proficiency of its members and regulation of the conduct of its members. The ICAG is a member of the Institute of Chartered Accountants of the Caribbean (ICAC), the regional, while monitoring is conducted by the ACCA. Council members of the ICAG said that the Kaieteur News or any member of the public, for that matter, is free to file a complaint against any of its members believed to be unjust in their profession. The members explained that every affiliate of the Institute is required to respect the confidentiality of information acquired. Kaieteur News was informed that once the report is made to the Institute, an investigation would be launched for the gathering of the necessary evidence. Once that aspect is completed, the relevant disciplinary action would be taken. “While the council has taken note of the email published by the Kaieteur News, it is not protocol for us to just start an investigation on one of our members without a basis. “The most suitable basis for us is an official complaint and Kaieteur News is free to do that. It is not normal for the institute to go after its members and there has never been something like this before on Sattaur and we would invite Mr. Lall to make a report and bring the evidence he has. “With his evidence, the investigations would certainly go smoother,” one member of the Institute said. The ICAG associate said, “It is rare that we have got complaints or reports about the political figures attached to our organization. But I think it should be made clear that we operate with integrity and we are for transparency. On the ACCA website, it said that members of the ACCA are required to observe proper standards of professional conduct. It said that the ACCA will take disciplinary action against its members, firms and registered students where there is evidence of a sufficiently serious failure to observe those standards. It was also stated that once ACCA receives a complaint, it may decide to proceed with its investigation, despite a later request by the complainant for it to be withdrawn. If a complaint results in a Disciplinary Committee hearing, the accuser may be required to give evidence. These hearings are generally conducted in public, meaning that anyone may attend, including you, the member and the press. Sattaur had sent the former president the tax information of several entities. This information was then forwarded to Attorney General, Anil Nandlall. Many have said that it is without a doubt, an undeniable breach of the Oath of Secrecy that was taken by the Chartered Accountant. Calls have been unending for Sattaur’s immediate resignation. In light of the publications of the email, comments from political figures, accountants, lawyers and even the ordinary man have followed, particularly on how the Parliament and even institutions to which the tax chief is attached should deal with him. Earlier this week, for example, letter writers explained that the GRA, like any other tax authority, is legally obligated to protect confidential tax information of others. As Kaieteur News continues to expose the interactions between Sattaur and Jagdeo, the letter writers said that it would appear that the GRA is leaking protected information. They reminded that this is a dangerous development, and as Moses Nagamootoo, the Vice Chairman of the Alliance For Change (AFC) highlighted, “possibly the worst crime in modern Guyana”. They opined that as a member of the Association of Chartered Certified Accountants (ACCA), Mr. Sattaur ought to know he is duty bound professionally to “respect the confidentiality of information acquired as a result of professional relationships and shall not disclose such information to third parties without proper legal authority (such an order of the court)”. 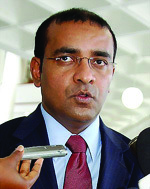 “It is just professionally incompetent and reckless to provide a private citizen in the person of Jagdeo with confidential tax information on other parties, especially those for whom he has a dislike,” one accountant said. They are of the belief that the integrity of the GRA is now under question, since its leader has been less than straightforward and “appears to be extremely dishonest in his dealings with the public”. The general view is that Sattaur should step down from office and allow his deputy to conduct the affairs of the GRA until he can be fully investigated in light of strong allegations of conflict of interest and improper professional behaviour.